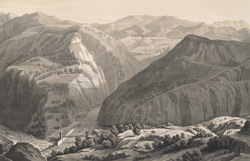 This lithograph is taken from plate 3 of 'Views in the Himalayas' by Mrs WLL Scott. This picturesque view was made at sunrise about a mile from Haripur, on the road to the military sanatoria of Subathu and Kasauli. The sanatorium at Subathu was for the East India Company's European Artillery and Infantry, and was situated on an isolated hill, on average 10 degrees cooler than the plains but 10 degrees hotter than Shimla. Scenes such as this moved Mrs Scott to comment on the power of nature to lift souls: "Having experienced it so fully myself, I believe that mountain scenery has an elevating influence on the minds of men of all nations who believe in a God." She wrote of "the noble mountains, magnificent forests, smiling fields and lovely flowers ... impressions of the sublime and beautiful in scenery", where the sorrows of this world were made "trifling and passing as a dream".